This is a big watch, meaning the face, and also I will have to have links removed to fit my wrist, but I have a very tiny wrist. It is very beautiful, but be aware on a small wrist it is quite large. 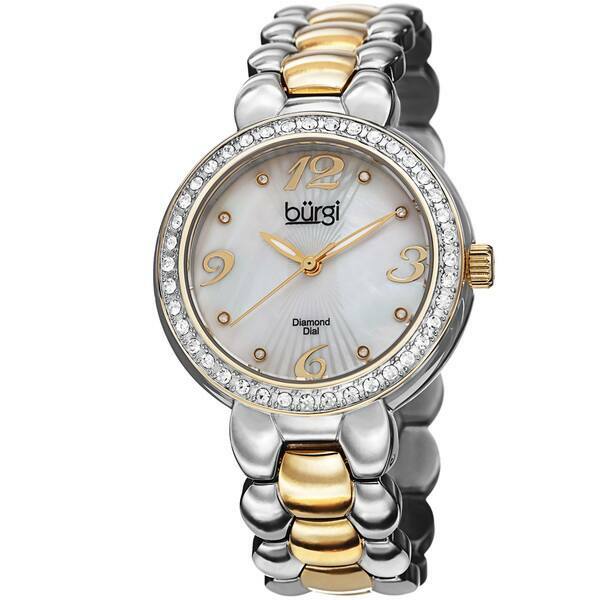 This ladies watch from Burgi features a mother of pearl dial with 8 genuine diamond markers. The stainless steel bracelet and Swiss quartz movement make this watch an exceptionally sturdy timepiece. The crystals on the bezel charm this attractive watch. This watch was a great purchase at a super price..the superior Swiss workings in this watch has never lost a minute of time plus the great looks, ‘lots of compliments’ I’m extremely happy with this purchase..
Love this watch, it looks a lot better in person than in the picture. I have received a lot of compliments! I did have to get 2 of the links removed, but it fits perfect. Exceptional buy for the price. Love this watch, comfortable, dresses up or down. It's a beautiful watch! Looks even better when you actually have it. Has a nice weight to it, not too heavy (per my wife). She loves it! It was a lovely watch but the clasp didn't work properly. Had to return it. The band is way too big. It's clunky and not very attractive. This was a present and I haven't heard any compliant. The band is too large, will need to take out some links but I'm pleased with the overall quality. I have another Burgi watch with a black face and I really like it. I needed a two-tone like this one and I like the bracelet band. Nice dual tone color watch. The band is very different like a bracelet. "What does MOP stand for?" Hello Gwen, I hope your day is going well. MOP stands for mother of pearl. Thank you for shopping with us.